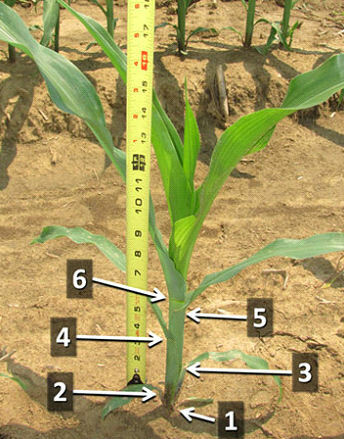 Recent research results indicate the V6 growth stage of corn is a good time to collect soil samples to check for damaging levels of plant-parasitic nematodes that feed on corn plants. Interest in plant-parasitic nematodes as pathogens of corn is greater now than in the past 20 years. Unfortunately, little research on the biology, scouting and management of nematode parasites of corn has been done since the 1980s, and there are no clear answers to many basic questions, such as when samples should be collected to scout for nematodes on corn. Greg Tylka, Iowa State University Extension plant pathologist and an expert on corn and soybean nematodes, provides the following explanation and recommendations. Young corn root system (plant not yet V6) dug for nematode testing. Population densities (numbers) of most species of plant-parasitic nematodes that feed on corn increase through the growing season, then decline as the corn crop matures and eventually dies. And most species do not damage corn when the nematodes are at low population densities in the field. Researchers in the 1980s established damage thresholds for the different nematodes that feed on corn, and the damage thresholds were based on "mid season" population densities. It is not clear what specific calendar dates or corn growth stages were meant as "mid season" by the researchers. Research on nematodes that feed on corn is currently underway in many Midwest states, including Iowa. And recent work with the endoparasitic root-lesion and lance nematodes on corn indicate that the V6 growth stage of the corn plant is a good time to start to collect soil and root samples to assess population densities of nematodes in a field. Corn at V6 stage of development. Photo credit Erick Larson, Mississippi State University. It is unlikely that a healthy looking corn crop would be growing in soil infested with damaging population densities of plant-parasitic nematodes. So sampling fields indiscriminately is not advised. But it might be worthwhile to collect samples to test for plant-parasitic nematodes in fields of unthrifty corn, and sampling near the V6 growth stage seems to be a good time. 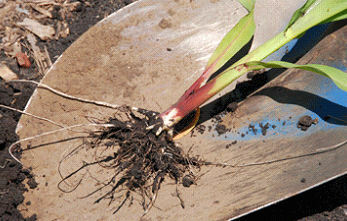 • Collect 10 to 20 12-inch-deep soil cores from the root zone of unthrifty plants. • Collect 5 to 10 root masses from V6 plants; the tops of the plants can be cut off and discarded, and soil adhering to roots can be removed as well. • Protect the samples from temperatures above 80 degrees, and do not be physically rough with the samples (by throwing them, for example). • Deliver or send the samples to a laboratory for processing as quickly as possible; avoid shipping samples on Thursdays and Fridays so that samples do not sit in delivery trucks over the weekend. The test for nematodes that feed on corn from the ISU Plant and Insect Diagnostic Clinic is called the complete nematode count. Samples sent to the ISU Clinic should be accompanied by a completed Plant Nematode Sample Submission Form (referred to on the ISU Extension Online Store as PD 0032) and a check for the $30 per sample processing fee. If damaging population densities of nematodes are found, there are no in-season tactics that can be implemented to mitigate the yield loss that will occur in the current growing season. Primary management strategies for future years are use of soil-applied Counter 15G and 20G nematicides and/or seed treatments such as Avicta and Votivo. The information obtained from samples collected this year may pay dividends in the form of more profitable corn production in future years.